Kim Kardashian and Kanye West have shared the first photo of their daughter, North West! Kanye was a guest on Kris Jenner’s talk show finale today (taped earlier this week) and the proud dad showed off the first picture of his baby girl. Kris Tweeted the photo to her millions of followers this morning, writing “Meet North West”. The couple reportedly turned down many offers from magazines who wanted to buy the rights to North’s first pictures. Kanye wasn’t comfortable with the idea and wanted to be the one to share her with the world. He’s hoping it will help calm down the paparazzi’s interest in capturing the first pictures. 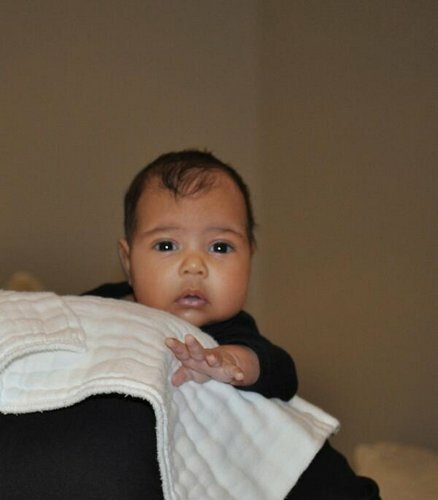 Take a look at North West below – do you think she looks more like mom or dad?